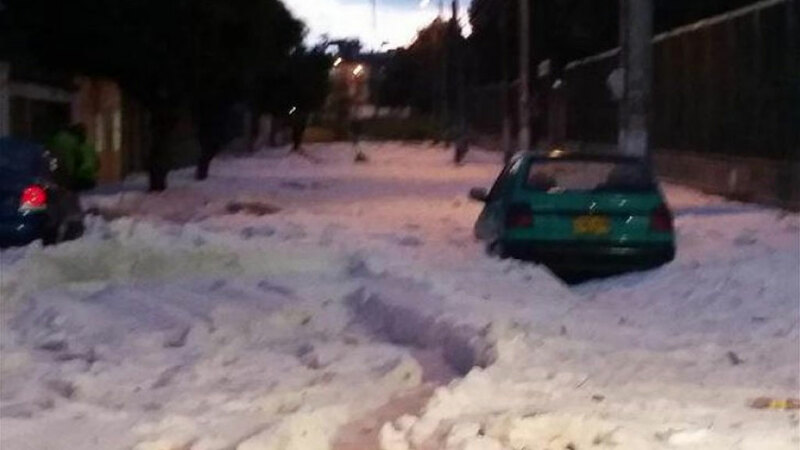 Colombia’s capital Bogota was surprised on Sunday by a major hail storm that covered the south of the city with a 24-inch layer of icy snow. The excessive hail caused a number of emergencies across the city. Entire streets became either covered in ice or formed rivers, while rooftops were damaged and trees fell down. “Fortunately there are no victims, just material damage,” Javier Pava of the Bogota Disaster Rick and Prevention unit was quoted as saying by newspaper El Espectador. The unit was called to rescue four people from a parking garage where the collapsed roof was preventing the victims from leaving. The iced water that came down caused major floods in the historic center of the capital city and the surrounding neighborhoods, according to the fire department. Following months of dry season, big cities like Bogota and Medellin are set for the rainy season, which is generally accompanied by excessive rainfall and hail in some rare occasions.